The countdown is really on, just two more weeks until Christmas! 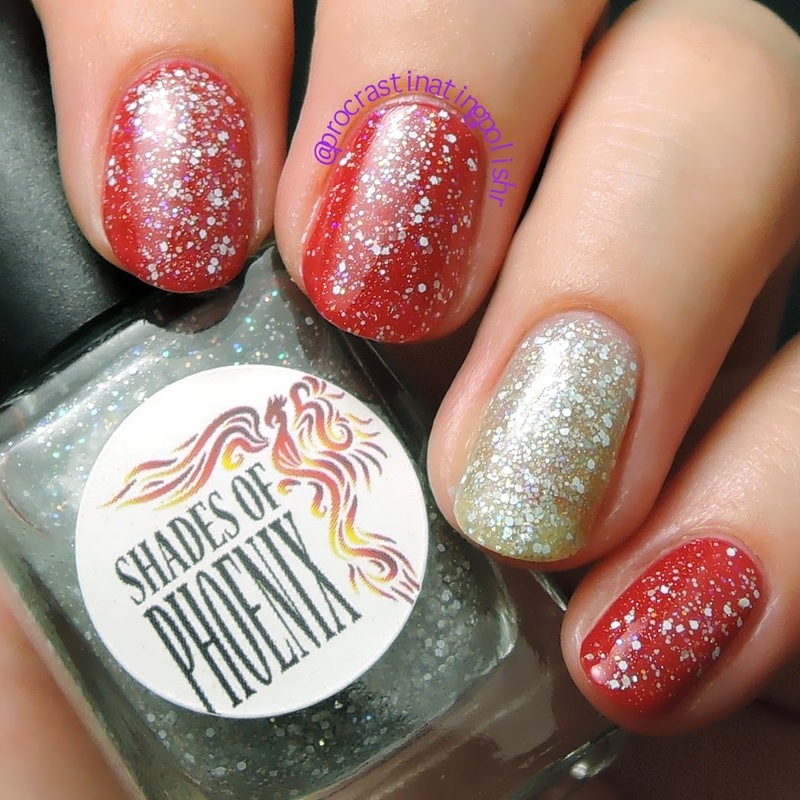 Shades of Phoenix are releasing their Christmas trio tonight and I have swatches of all three to share with you courtesy of the lovely Teneil, the brains behind the glitter. Not your average Xmas colour, Holly Crush is a beautiful shimmering pastel pink creme packed with matte micro glitters in pink, orange and yellow. I recently made my peace with pink after accepting that pastel shades are really flattering on me, so I was excited to try this one out. 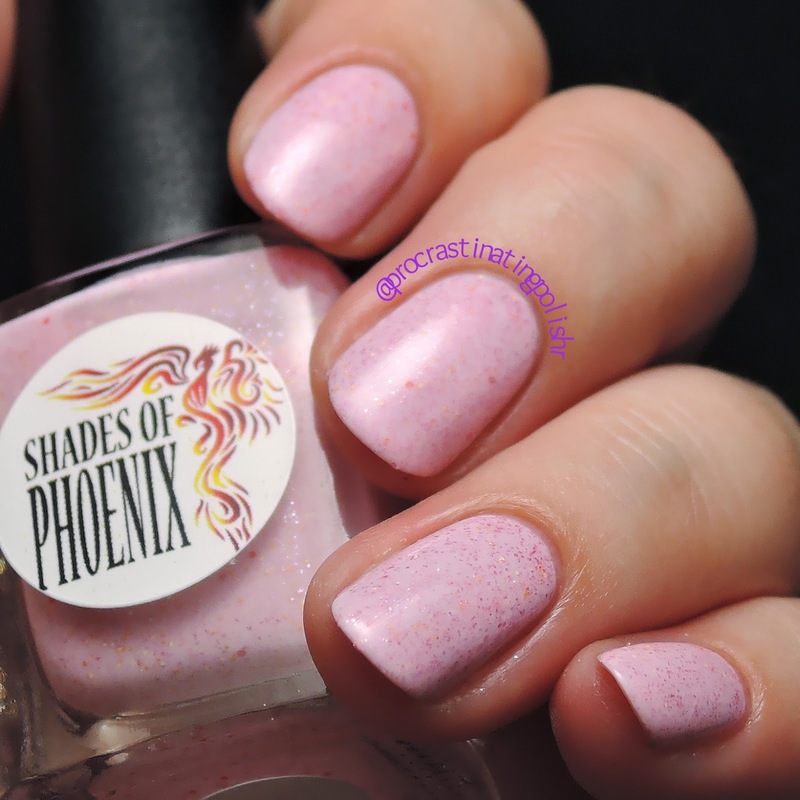 The shimmering micro shards are my favourite element of this polish, alternately popping a deeper shade of pink and reflecting silver light. This was a little gritty to apply for the first coat, but I just made sure to wait an extra minute between coats and I didn't have any issues after that. One coat of a regular quick dry top coat was all I used for my swatches. I made sure I left this on for just a little longer so I could try a bit of extra sparkle as you'll see below. In the bottle Tinsel Tease looks like another silver glitter topper, but to my eternal delight it is packed with matte white and grey glitters along with a whole load silver iridescent sparkle. Even though it's clearly a topper I did three dabbed coats on my ring finger to see how it built up. It's still too sheer for regular wear but I think it would be great as a base for stamping. 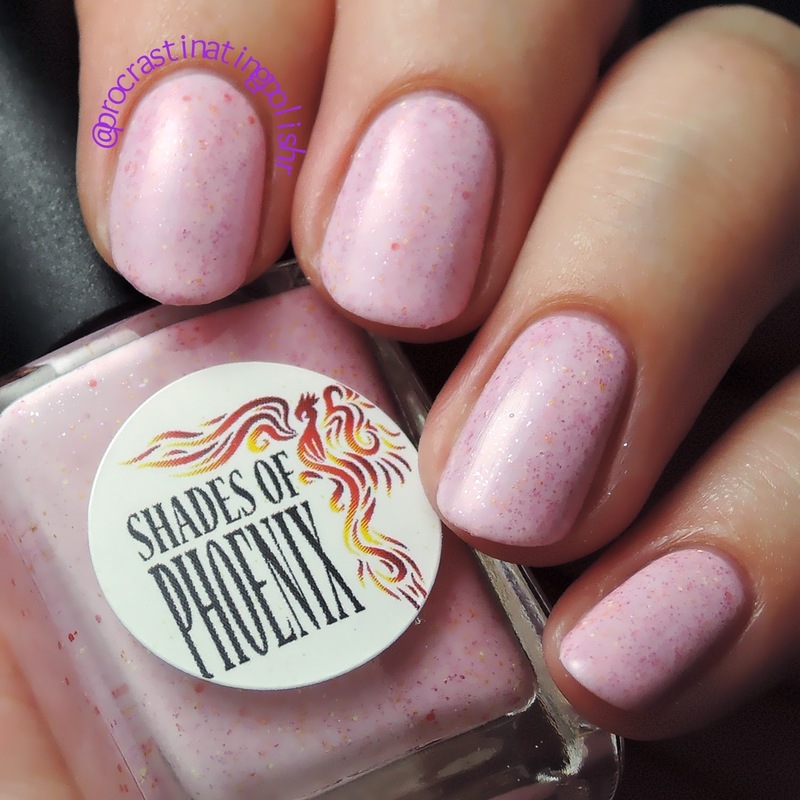 My swatches over Shades of Phoenix Rouge are, index to pinky: two thin coats, one dabbed coat, three dabbed coats and one thin coat. I think I like it best when it's sparse on the nail, like a delicate refreshment for your base. 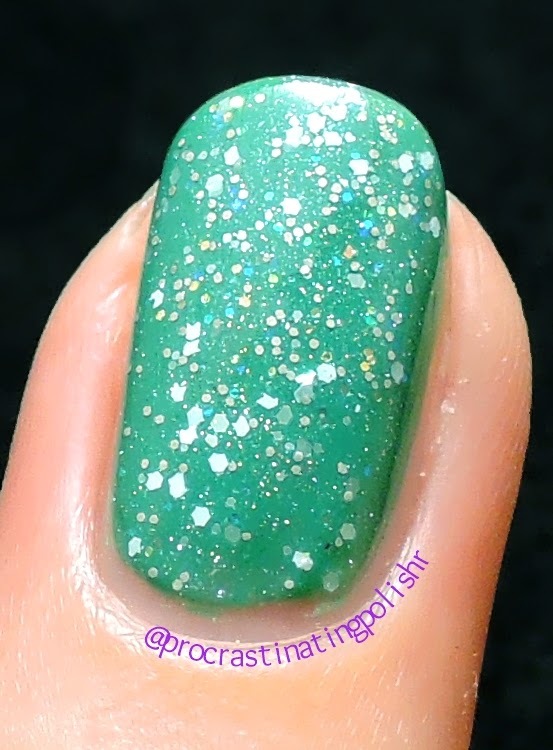 It's got a nice consistency to it so the glitter doesn't just sit on your nail in clumps - even the three dabbed coats only needed one coat of top coat. Naturally I had to put these two extremely girly polishes together for the girliest mani I think I've ever done. Isn't it freakin' adorable? It made me feel like a sugar plum fairy. I had to try Tinsel Tease over another base because I really wanted to show off the pale grey glitters and it turned out so nicely I had to throw it in here. I love how this shows off the grey as well as the little iridescent flashes. I used Ulta3 Pacific Fever for undies and dabbed on one coat of Tinsel Tease. I didn't intentionally save my favourite for last, but given it's spelled with an 'X' and not a 'Christ' it ends up here because I went with alphabetical way. Let me be straight with you - I love mint polish. I will buy every mint polish that is within my grabby little mint loving hands and I almost certainly have more than I will ever need. So I most definitely let out a little squeal when I opened up Xmas Fling. This is one of the most delightful crellies I own. The base is perfectly balanced to reach opacity in three coats while still letting those little first coat glitters peek through. I managed to get a big circle out about two out of three times without fishing. I often would wipe them off the brush for fear of using them all up too fast! 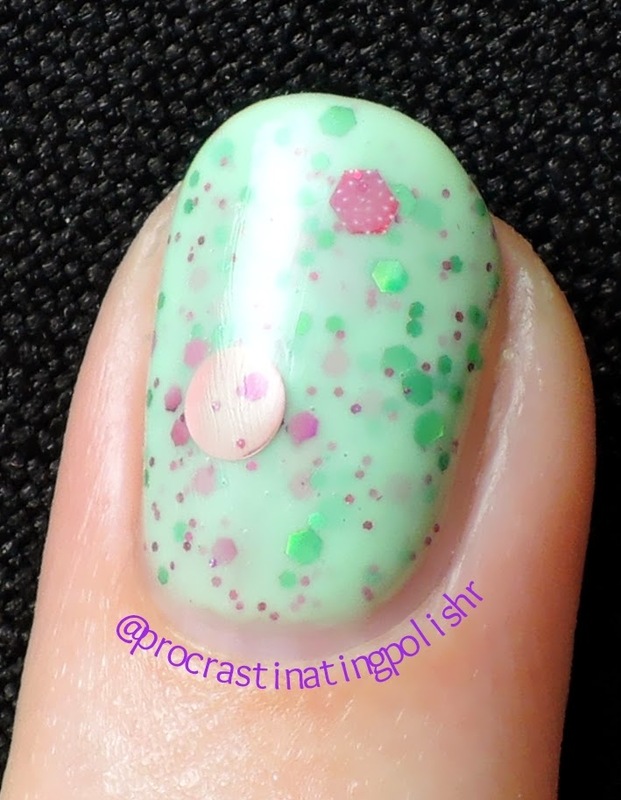 As often with crellies featuring larger glitters you do have to manipulate that last coat a little to make sure everything is flat, because you can't hide the imperfections with layers of top coat like with a jelly. Fortunately I had no trouble finishing off with a thin coat and a small prod here and there. I top coated with Essence Gel Look Top Coat and Gloss n Sparkle The Shining. 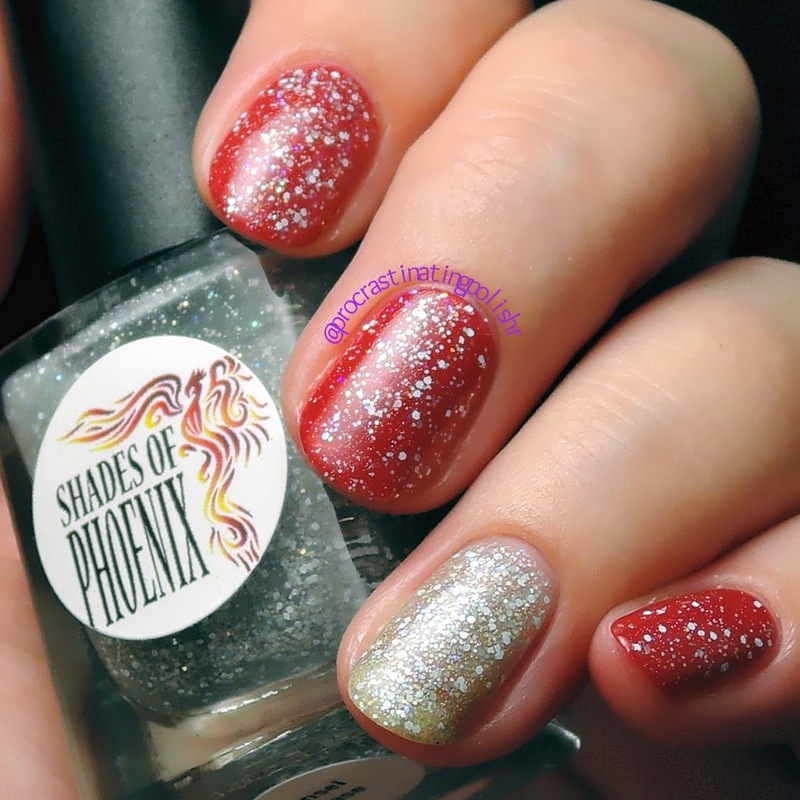 The Christmas 2014 collection is available right now for $9.95 each on the Shades of Phoenix website, perfect for lovers of polish who want something a bit less obviously holiday themed and more feminine for year round usage. 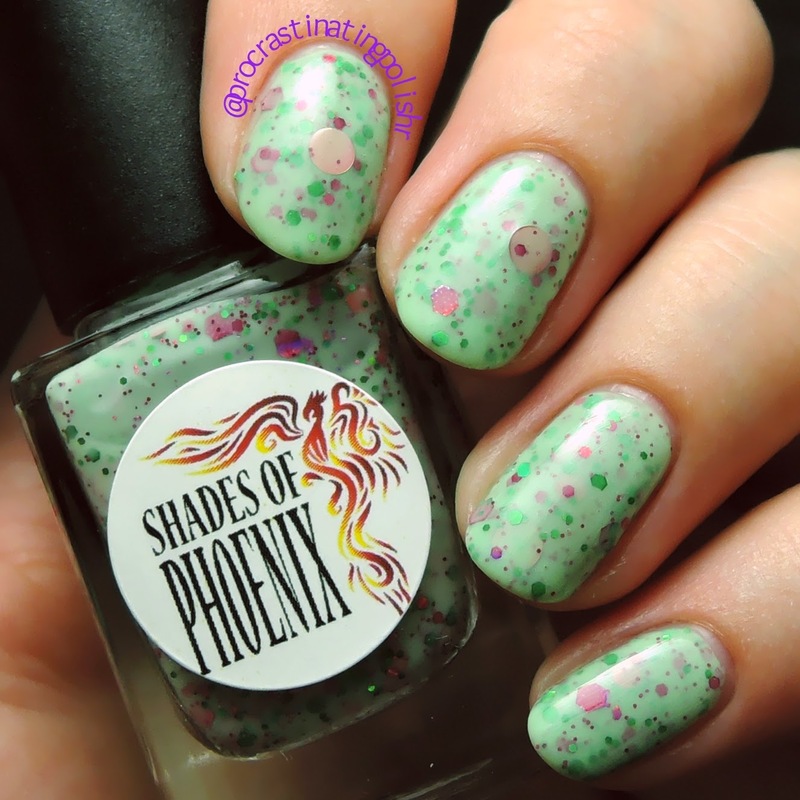 *The abovementioned products were provided by Shades of Phoenix, which in no way affected my opinion of the product. Please refer to my Disclosure page for more information.